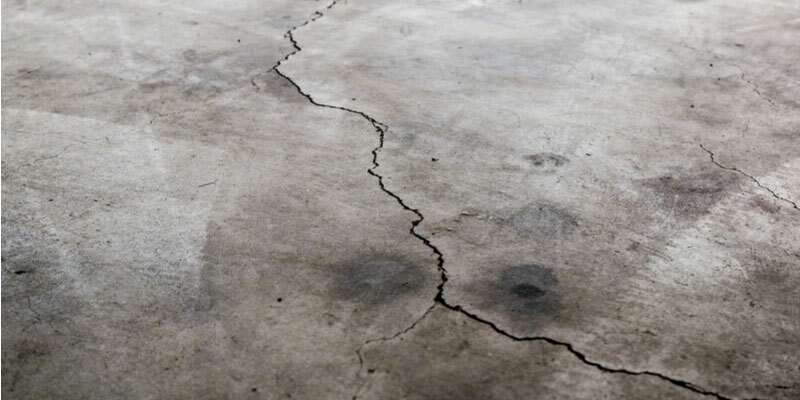 Some of the most common reasons for cracks in garage floors are settlement, shrinking, improper installation, and poor drainage. In some cases, cracks are nothing to worry about. After all, one thing is for certain when working with concrete, it is destined to crack at some point. You can tell if cracks in your garage floor are serious if they have an opening that measures 1/8-inch or more in width, and/or if one side of the crack is higher than the other. Here’s a look at some of the most common reasons for cracks in garage floors. Cracks related to shrinkage are typically nothing to worry about and are common. Natural shrinking occurs during the curing process, so it’s normal for even relatively new concrete to have a couple cracks. The soil under your home or building can move and sink over time, a process known as settlement. A little bit of settlement is normal over the years but it can put pressure on garage floors and result in cracks. Settlement cracks are generally more serious than shrinkage cracks. Ultimately, severity depends on crack width and if it continues to grow or not. Advanced settlement cracks are open buckets waiting to collect water. Unfortunately, this collection of water leads to greater problems, including the potential for sections of your garage to sink below others. This greatly increases your risk of flooding. Depending on the layout of your garage, different areas will undergo a lot more pressure due to the weight of vehicle tires. This can naturally cause cracks to form and settlement may occur in corners of the garage. Look out for wide cracks where one side is higher than the other, as this may indicate more serious settlement issues. The sooner you identify issues the better, so have a professional out if you are concerned. If the garage slab is poured at the incorrect level, water has a chance to move from an attached garage into the home. Furthermore, the garage floor slab must be poured so that it gently slopes down and away from the house to promote drainage. Water can play a huge role in the formation of garage floor cracks, especially if water is not draining away from your home as it should. The presence of heavy clay or other types of dense soils cling onto excess moisture. Water-heavy soil may freeze during the winter, causing the soil to expand and put considerable pressure against the garage slab. This can cause heaving and cracking. It is very common to see cracks near the garage door, that’s because this area has the greatest exposure to cold and frost. Check the perimeter of your garage for areas where water could get in and make sure it is well-sealed. Exterior soil levels should measure around six-inches below where your garage floor starts. Small garage floor cracks are common and could be nothing to worry about. It’s the bigger and continually growing cracks that warrant concern. Keep an eye on cracks and if they appear to be getting bigger or worse, contact Turnbull Masonry for a quick inspection you can trust.